I have a confession to make (I think I may need a support group). My name is Emily and I was a gifted child. Joking aside, it’s something that I always feel awkward admitting – a bit shameful. It smacks of elitism, this gifted label. “What, you think you’re better than me?” I don’t. I really don’t. I know all about the pitfalls of intelligence testing, of narrow definitions of intelligence, of sub-tests that were later thrown out. The day I took the intelligence tests is one of my few clear memories of early elementary school. I can remember tearing through the verbal/analytical part, flying through the general knowledge, and grinding to a halt at the spatial reasoning – darn those puzzles. Was there a puzzle of a duck? I’m pretty sure there was. I can remember being called to a little room by one of my classmates as she returned from her test and being told to fetch the next child when I came back. Neither of them joined the program. The reasons why we were chosen for testing and why we did or didn’t get invited to join the program were mysterious to us. No one ever explained and the whole thing was spoken of in hushed tones. My parents were very uncomfortable with the whole thing – embarrassed even. My scores weren’t something I should ever talk about – I didn’t even know what they were until I found them as an adult – I knew not to ask. I can remember telling a friend about what we did ‘in gifted’ and being admonished not to talk about it – I might make her feel badly. As a child it was very confusing but as I got older I started to understand more about the complications of privilege. What we did at school on Wednesdays during our pull-out program wasn’t a subject of conversation at school or at home but, and here’s the kicker, it was, by far, the best day of my week. From grade 5 to grade 8 I lived for Wednesdays and from grade 9 to grade 13 I survived because of the space that the school allotted for gifted students to work and hang out and the events that they organized for us. So here’s the rub; I’m torn in two directions about giftedness. On the one hand, I question whether it even exists. Aren’t all children gifted in some way? Children have so many gifts, so many talents, and so many ways of communicating them. Doesn’t a narrow intelligence test reduce all of that complexity to a falsely simplistic score that can’t possibly capture all of the miraculous diversity of children’s potential? Yes, yes, and yes. But then, there’s this first hand-experience of being outside of the norm, feeling different, weird even, and of being saved and supported by the very elitist programming that supports children who, popular wisdom tells us, will succeed regardless of what we do, even in spite of us. So where does all of that angsty internal conflict leave me when it comes to my own classroom and to the children in my classes whose abilities lie outside of the bounds of that famous bell curve? It leaves me flumoxed sometimes, to be honest. 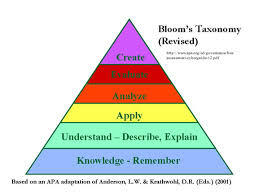 When I was in grade 5, we learned (in gifted class, of course) about Bloom’s taxonomy. We learned that acquiring knowledge about a subject – which was what we did most of the time in our regular classrooms – was only the beginning of learning. We were aiming higher, towards the upper echelons of the pyramid. Analysis… synthesis… evaluation… onward! This type of learning typified my experiences in those special classes – we were always pushed to go deeper, to think bigger, to look at problems from another perspective, frankly, to do what I now call “inquiry learning.” Subjects were never assigned to us; we got to choose what interested us. I can remember creating personal utopias and doing research in Dance History. I even worked for the local Provincial Member of Parliament – I was 13. Follow your interests, that was the mantra. Imagine if school had been like that every day. Would the program have even been necessary? Today Bloom’s Taxonomy looks different. A new level has been added to the top of the pyramid: creating. So where does that leave us in Kindergarten, when creating is at the foundation of everything we do? For our students, knowledge doesn’t come first – it’s not a prerequisite – it often grows out of their creativity, not the other way around. Children are creating from the very first day they come into the classroom; they’re creating from the day they’re born. How do we frame this notion of giftedness when we’re tackling learning from a completely flipped point of view? Another story: When I was in grade 6, our teacher decided that we needed an extra challenge so she chose a few students who would use a different spelling book for weekly dictations. They were small pink books – hard words lived inside. Each week, we would wait for our turn to have our own, super-hard words and sentences read out for our special dictation. While I am grateful that I can spell chrysanthemum (that may have more to do with Anne of Green Gables than with grade 6 spelling), this experience represents for me the worst of what enriched programming can be. Too often, our attempts to challenge kids just mean giving them more of the same; more surface learning, more rote learning, more but not better. What I am most thankful for in Ontario’s Kindergarten program is that it gives all children the opportunities that I only got on Wednesdays. 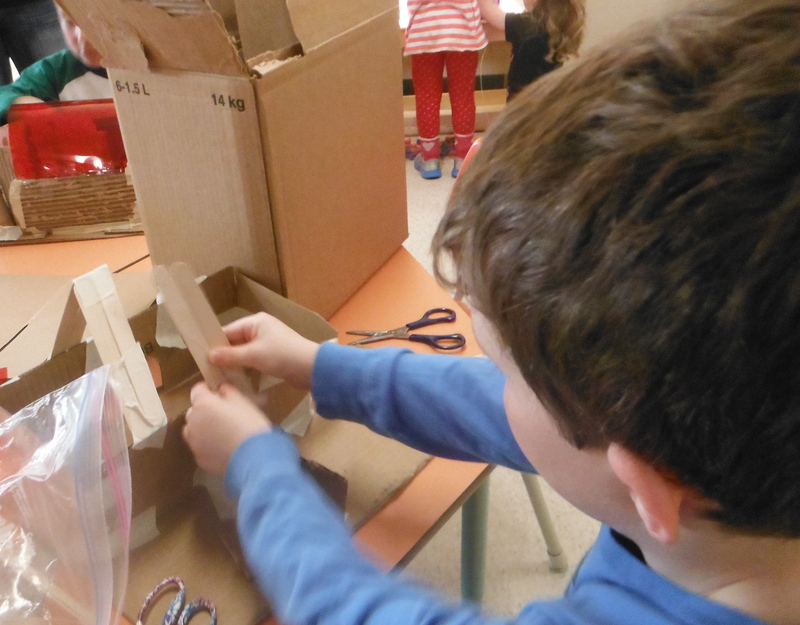 In our class we spend most of our time creating and that provides children whose interests and gifts lie all over the bell curve with regular opportunities to problem solve and to ask big questions. Children’s questions are spectacularly different. Their play is as diverse as they are and sometimes what they do doesn’t fall into a neat, academic, curricular box. But I have, without question, observed children who I’m going to call gifted (for lack of a better term) find challenges for themselves in play. I have had students who have led read-alouds in their second year of Kindergarten. I’ve had students learn how to crochet, knit, and play complicated string games. I’ve had students create their own fashion designs. I’ve also had students create marble runs and block structures of incredible complexity. Today I had a student describe a long narrative about her block structure; she has a spectacular imagination. Last week, FI problem-solved how he could create trusses for his roof using tongue depressors. It is often challenging to stay ahead of them, to remain nimble enough to meet their needs in a large classroom. But I am heartened that, if education can remain focused on creativity, great learning will follow. 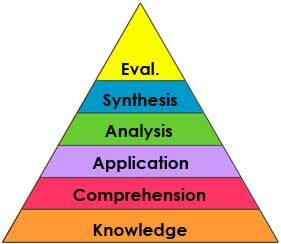 Like water trickling down the side of the Bloom’s pyramid, we will get to the knowledge if we start at the top. One of my favourite things about the Reggio Emilia approach is its focus on the Arts as valuable languages of expression for children and adults. Whereas in traditional schooling, we tend to treat the arts, at best, as a nice but unnecessary frill, something we can relegate to Friday afternoons when children are at their worst and can’t handle any ‘serious work’ – the hidden curriculum being that we don’t think Art is hard work, we don’t validate it as a career path, and we don’t value what it teaches us – all well-intentioned, I’m sure. But is it true? Ken Robinson, and many others (Maxine Greene comes to mind), would disagree. I always have lingering in the back of my head that developing good fine motor skills are a critical part of the kindergarten experience. Partly, this is because of all of the conversations I’ve had with teachers that have centrered on the misconception that the only way to teach fine-motor skills is by using worksheets (colouring, cutting). But there’s another, more personal reason. When my eldest child was recovering from surgery he had as an infant, I sat beside him as he slept and marvelled at how small the sutures were (the things you fixate on when you’re exhausted). They were impossibly small. How could anyone have such precise fine motor skills? And what am I doing in these early years to make sure that children have the fine motor skills they need to pursue any career they want – even pediatric surgery? The arts are one of my solutions. 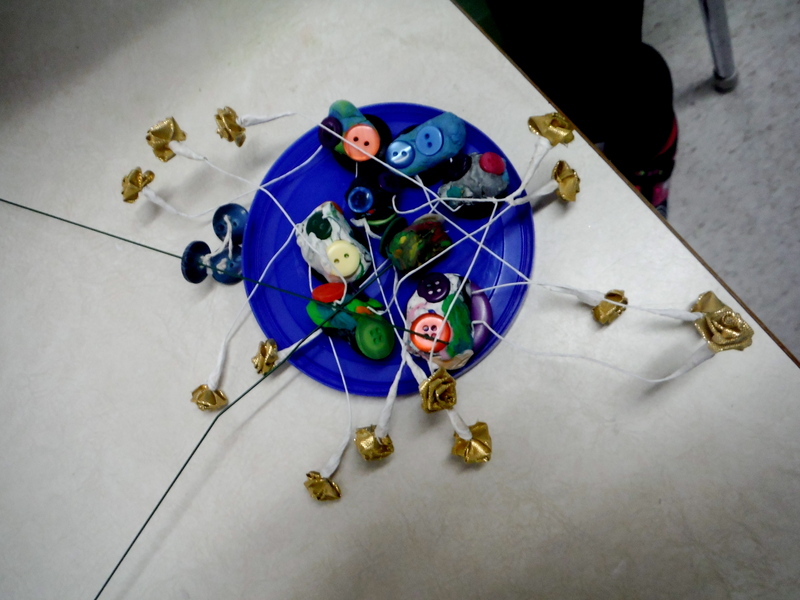 There is more fine motor development in making a sculpture than there could ever be in a worksheet. 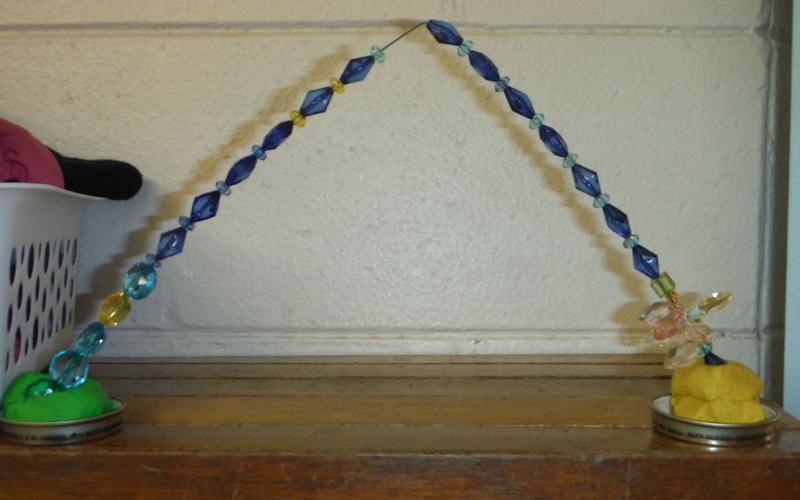 This week we’ve returned to a favourite activity – beading – but with a twist. 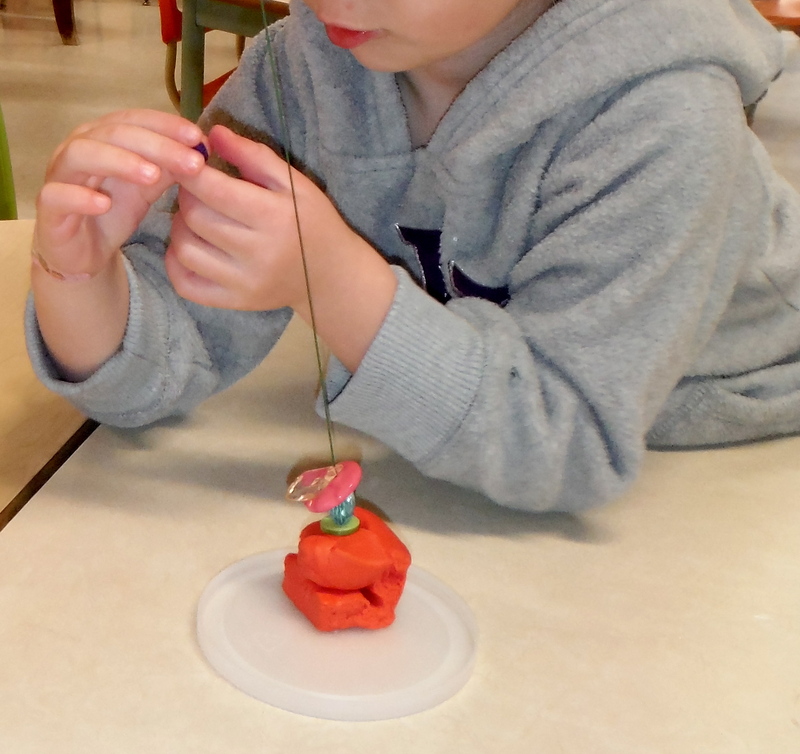 A parent donated thicker, heavier wire than we’ve had in the past and they were able to create 3-D sculptures using plasticine as a base. It has presented many challenges. Stringing the small beads and buttons onto the wire after struggling to pick them up, bending the wire, and manipulating the harder plasticine. We’ve also noted that they’ve had to think about the structural integrity of their sculptures and have tried a variety of strategies to get them to stand on their own. There’s also been lots of learning demonstrated in patterning and measurement. They’ve had a blast working with these new and familiar materials and their creations are just beautiful. I hope you enjoy them as much as we have! It’s been really cold here in Northern Town: freeze your eyelashes together cold. We’re a pretty hardy bunch but even we have our limits and we were stuck inside for a few days while the wind blew itself out and the temperature came up a few degrees. What to do, what to do? What do you do inside with 35 children when it’s -35˚C outside? We decided to play with ice! 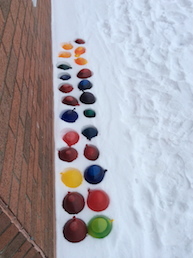 Our amazing ECE led the children in filling balloons with coloured water and braved the weather to place them outside. water… meet your new friend cold. Today during our outdoor inquiry time we ripped open the ballons and found that the water had frozen beautifully and that it had produced an interesting effect. 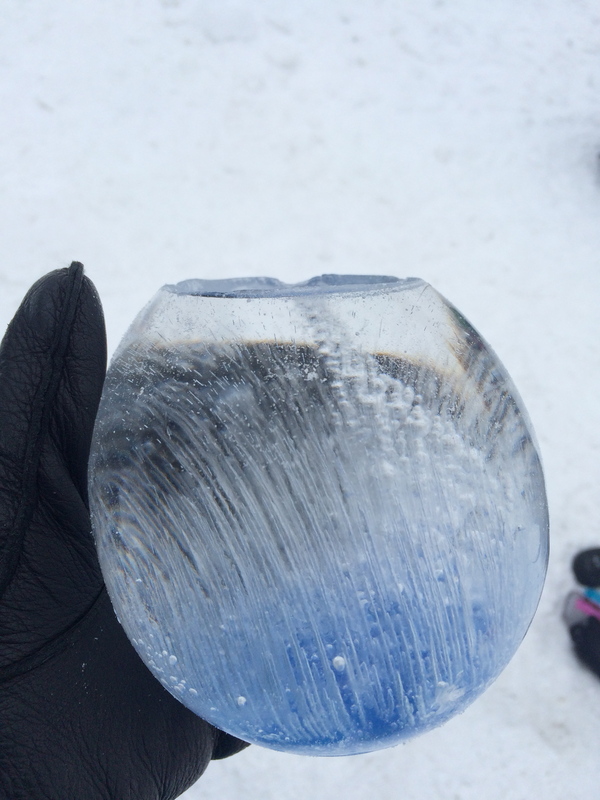 All of the colour had migrated to the bottom of the balloon and rows of air bubbles were visible within the orb of ice. When I showed the children this photo on the Smartboard, I told them that I wondered (je me demande…) why all of the colour had gone to the bottom of the balloon. What did they think? UN: If you drop it it will crack open and you can’t get a new one. CF: The gravity was pushing it down – the blue – because of the the bubbles. At this point in the conversation there was some back and forth about the bubbles so I asked: What are the bubbles trying to do? BW: I think the ice is growing and the bubbles don’t want to pop. AQ: The food colouring wants to get out of the balloon from the bottom – it wants to dig through the ice. UN: I think the ice is growing and the bubbles are going to break the ice and when the ice is broken they want to run away and go back to their home. I find their thinking fascinating. It opens up a window into their minds and gives us precious information about how they’re making sense of the world and how we might help them to develop their thinking. Some of them are drawn to creating a narrative using the bubbles, water, and food colouring as characters. Others are interested in the science of the process and are trying to figure out how it works. Others still are using what they already know about the world (gravity, weight) to create a hypothesis. Another group of children is more interested in how they are personally affected. XC, for instance, said: “If you drop it, it might break” – she has a point! There will most definitely be more cold weather ahead – let’s see where else the ice can take us! I think I need to rename this blog… maybe it should be called “teaching on the verge… outside” because it seems that this year, especially, so much of what I’m noticing is happening outside. I think that this has a lot to do with the greenbelt strip we have at the edge of our playground which offers so many more possibilities for learning than a traditional playground ever could. We recently had a day of heavy rain which melted all of our snow. This was followed by a drop in temperatures and a good dump of snow. 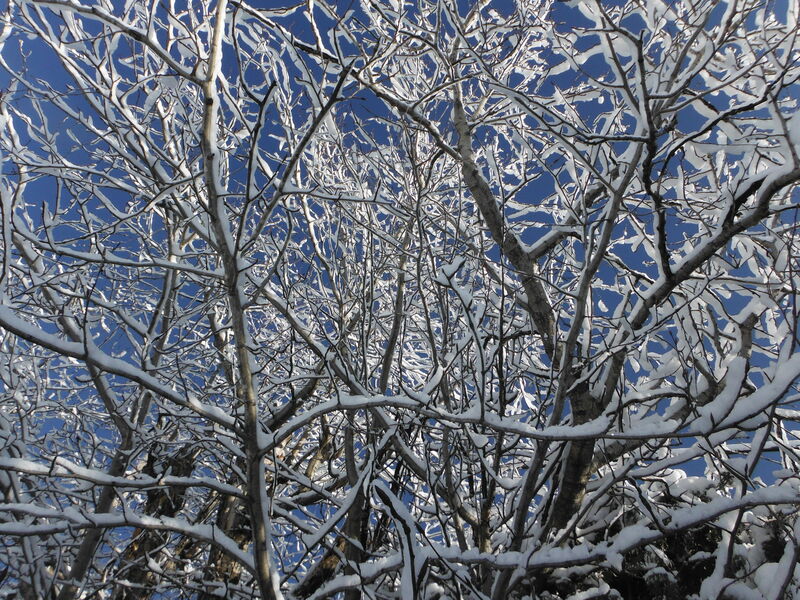 The snow stuck to the ice which had formed on all of the branches, creating a beautiful effect that puts every branch into stark relief against the blue sky. 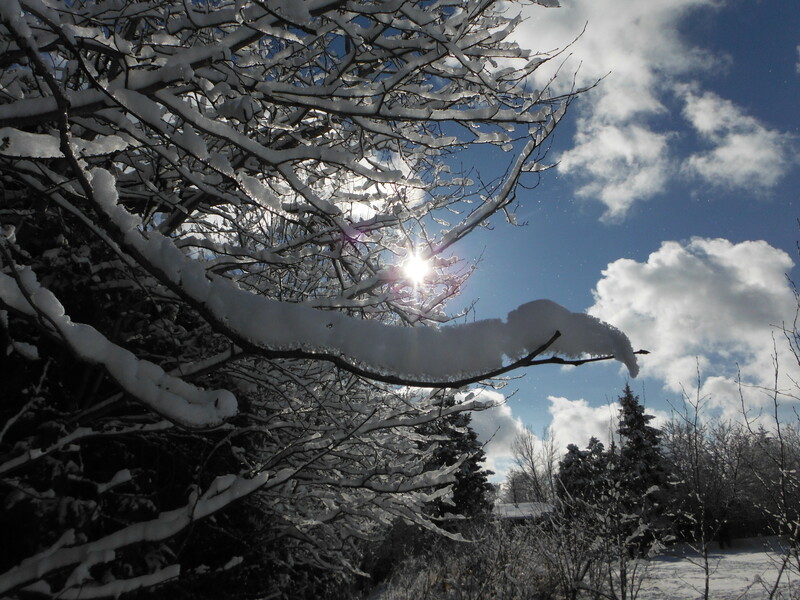 The denuded trees looked sparkly and crisp and the evergreens were heavy with layers of snow and ice. FI asked if the trees had grown; everything looked fuller and more substantial. According to the calendar it’s still fall… maybe we need a new calendar! It is like walking into a winter wonderland. 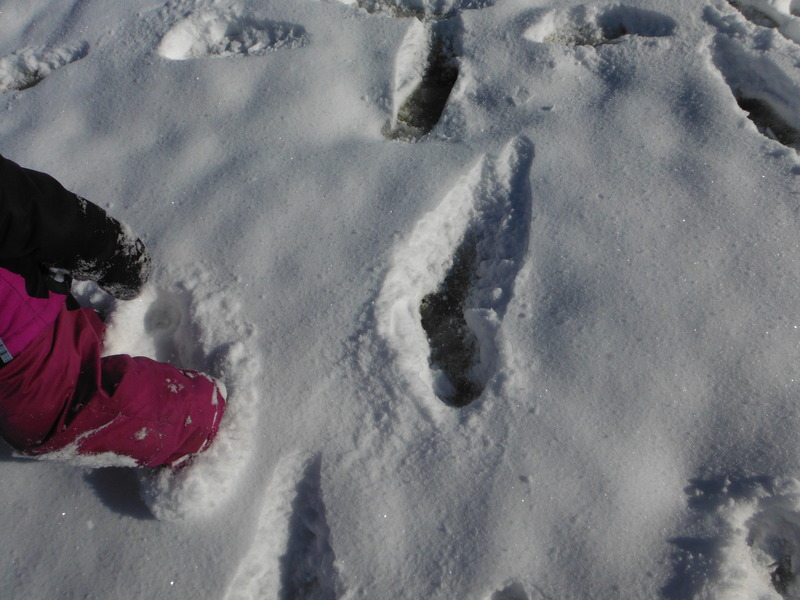 LH was very interested in the way her feet crunched through the snow and the frozen slush underneath, leaving very defined footprints. 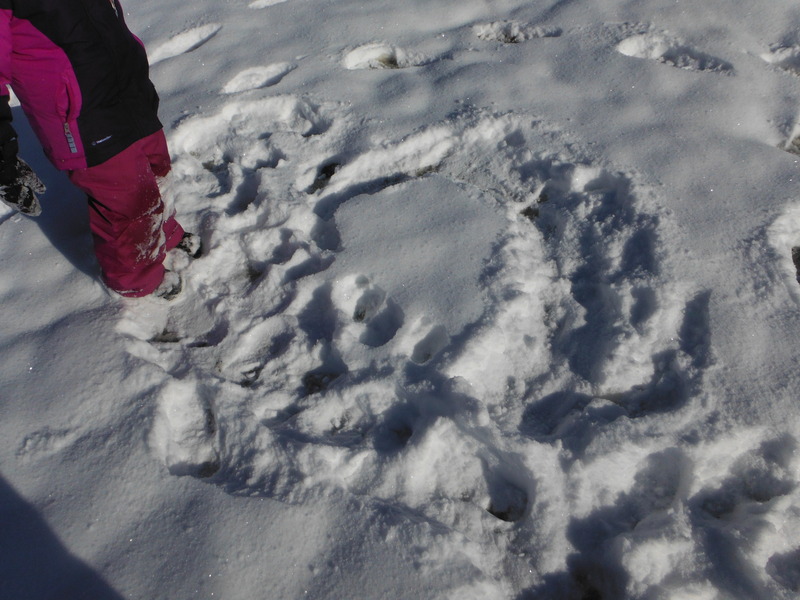 She took me to see a large footprint that she thought belonged to a monster. Then she created a footprint of her own which she told me came from a big dog. LH has an amazing imagination so this discussion of footprints quickly swerved in a different direction as a group of students came to tell us about the chipmunk they had just seen. 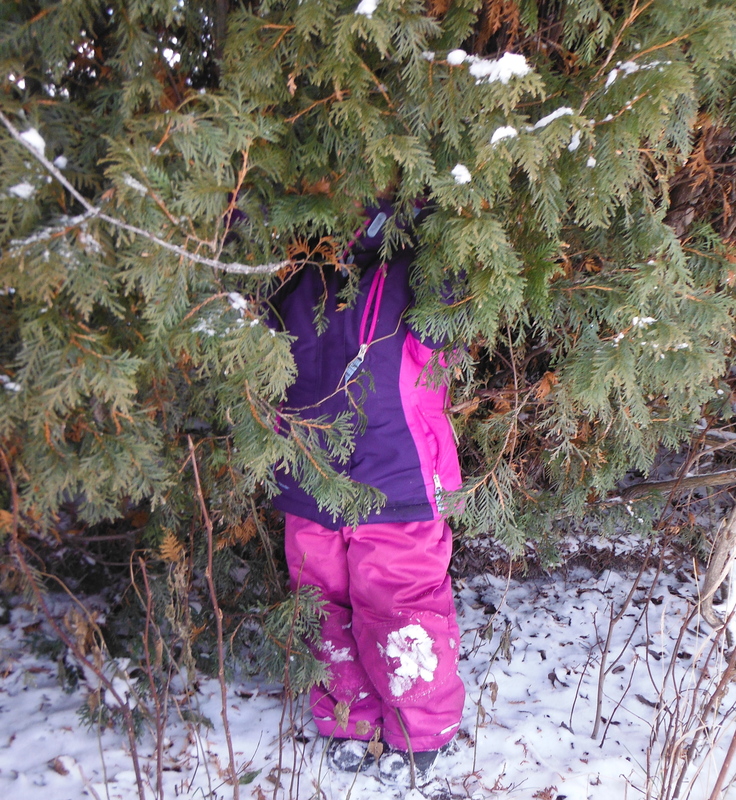 In response, LH said: “At my grandma’s I saw 18 chipmunks, 18 dancing chipmunks, and they did cartwheels and skated on the ice.” She then decided that she should camouflage herself, like animals do. 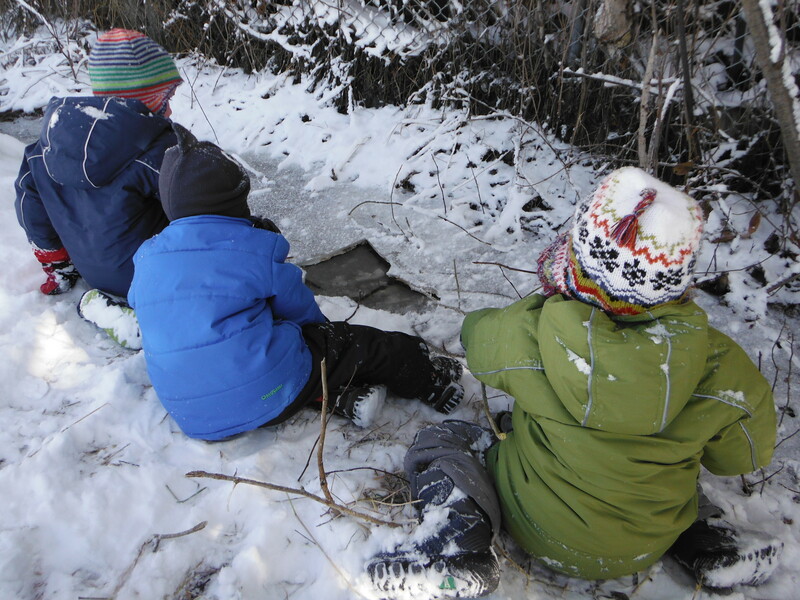 As LH was hiding in the branches, I noticed two boys playing on the ice in a nearby ditch. 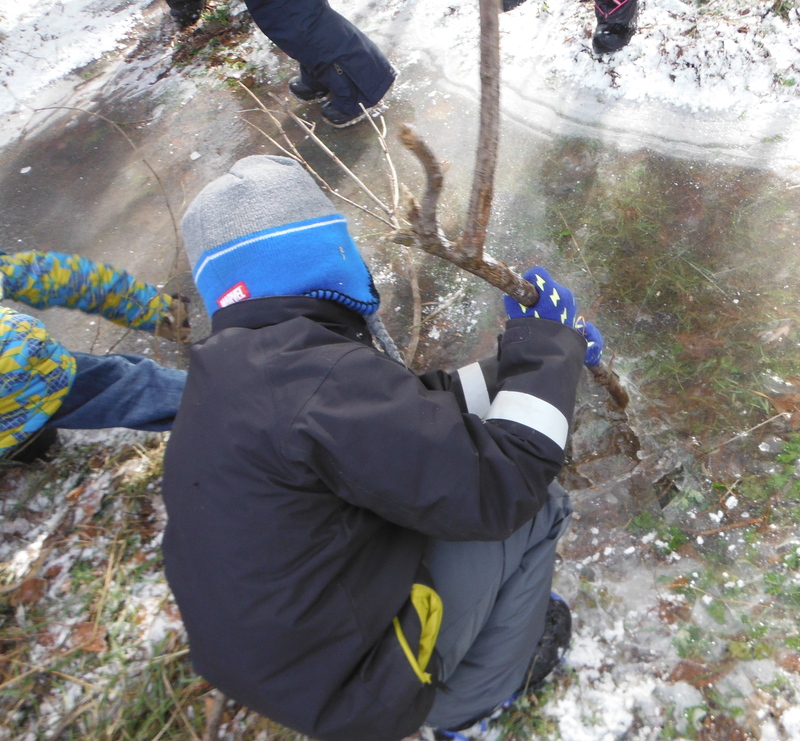 I was concerned because the ice had weakened during the rain so I went over to show them that it wasn’t safe to stand on. I cracked a hole in the ice with my boots and the children moved back on to the bank. They were undeterred, however, and changed their game. Now, they were ice fishers! 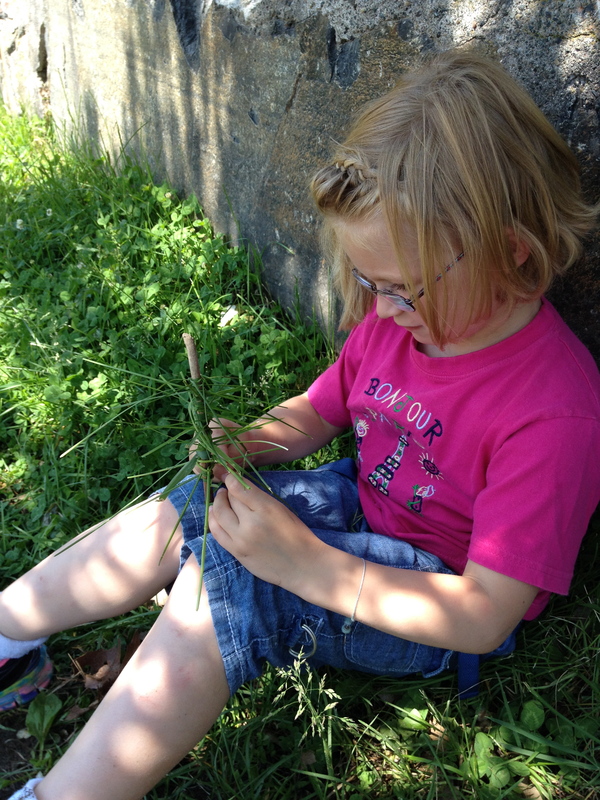 They found sticks and vines on the ground and began using them as fishing rods. One of the boys, BH, often engages in fishing-play. He rallied the others to fish through the hole in the ice. He told them: “You have to be quiet so the fish don’t get scared.” LH joined them and told us: “I ate fish last night and it was real: I put ketchup on it.” Clearly, only the realest fish needs ketchup! Still under construction but we’re getting there. 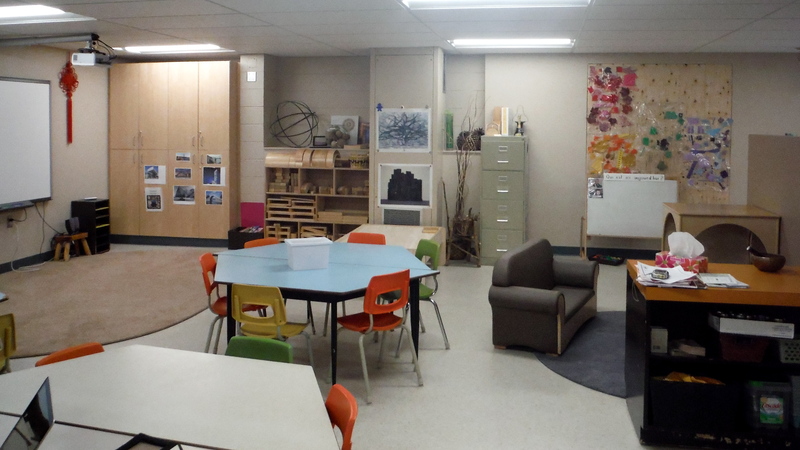 In August, I showed you some photos of our newly renovated classroom when it was completely empty. Over the course of the last few months, our supplies have slowly trickled in and we’re finally feeling as though the room is beginning to take shape. We’d love to hear your thoughts on our 4th teacher (we already have 3! )… the environment! And in case you’re wondering… we still don’t have a window! We are the ice police. We have had ice before today; thin sheets on shallow puddles. Today was the first day that we had real ice. The kind you have to stomp on to get it to break, the kind that beckons you out to the middle of foot-deep puddle/ponds to see how many jumps it will take to break through. This was serious ice. There is something about ice that just begs children (and adults, I confess) to break it – such a satisfying crunch and the interplay between the solid layer on top that conceals the liquid beneath. It leaves you wanting more and more. Being the committed inquiry-based, child-led teacher that I am, all of this ice leaves me in a pickle. I can’t let them walk out into the middle of the puddle/pond because I know that eventually they will break through and find themselves knee-deep in cold, icy water. But, at the same time, I don’t want to entirely deprive them of the ice-breaking pleasure that they so crave. So we become the ice police. We chase them away from the deeper spots and we let them go to town on the shallow puddles and ditches. Sometimes, when I’m watching them, I stomp down with my own heel… just to hear the crunch.